Click the arrow under the word "Tube", and select HQ for high quality. Reattachment is out now! Listen to the entire album here for free, and add the songs to your stations while you're at it. Order the album here, at CDBaby. See the sidebar on the right for more ordering options. Also available for streaming are Dan's previous two albums, Neon and Gold and Culture of Self. If you're wondering why these albums are available here for free, the answer is simple: IAC pays Dan a royalty for each song you listen to. Dan Wallace wastes no time proclaiming his aural affection for a few different strains of guitar goddery on Reattachment (Torito Bravo). The album’s melodies slide over and around beds of ax triumph that effortlessly recall the best of Robert Quine’s latter work with Matthew Sweet. Wallace is tasteful with his indulgences, however; in fact, it is downright refreshing to hear some 32nd note trilling in the context of such songs as the title track and the elegant, Django Reinhardt stylings of “Odd Man Out”. It must be assumed that this is quite a treat to witness live, with Wallace’s supple fingerwork providing all the pyrotechnics necessary. The music industry is a cold and heartless beast, or as Hunter S. Thompson put it, “A cruel and shallow money trench…” Now without taking that quote out of its original context (Thompson actually uses it to glorify the music trade) for the purpose of this review, I include it to highlight the importance of people like Dan Wallace. A man that proves it’s not all about crack, lawyers, leeches, pimps and preachers. Standing like a beacon in an ocean-sized swamp, Wallace embodies not only the sound of wild and rumbustuous past generations, he surrounds it in a spirit and aura of independence. What is there to respect anymore if not independence? Out there somewhere in Chicago where the sun beats down on the wind and burns the streets like magic magma and dust covers the invisible pain of bad trips on the great lake, there is a sound that doesn’t quite flow. A sound as distant from the location as it is from its time. Reattachment is pop sugar from a sperm whale’s blowhole, it's funky melodrama and twisted irony, and an almost lazy rhythm ‘n’ blues. With a tidy gloss like prehistoric amber-coated fossil this post-modern organism is the 2008 vintage homebrew right out of an Illinois wine cellar. Now, I’m talking collectively rather than track specifically. It doesn’t matter to me if you buy Reattachment, Culture of Self or Neon and Gold. They’re all special pieces of work as far as I’m concerned and they don’t sound all that different from each other. If per chance say you listen to Dungen, The Shins, The Eels and Zappa then add this man to your collection of unerring folk pop music. 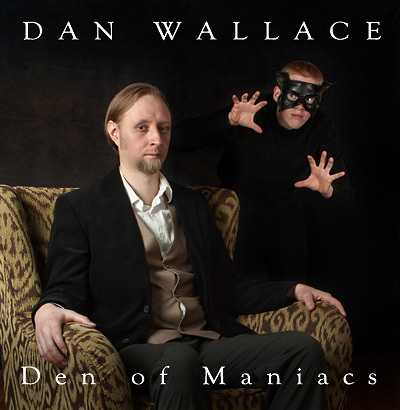 Dan Wallace sends out his music personally because he specifically wants you to hear it. He even signs the cover letters himself. Crackers, I know, but it’s the little things that make the difference nowadays from the pits of this “cruel and shallow money trench”. Dan Wallace has managed to do it again. Repeating his success but not retracing his musical steps, Wallace gives us "Reattachment", the follow-up to last year’s eclectic and mesmerizing "Culture of Self" album. Self-revelatory without becoming self-indulgent, "Reattachment" reveals Wallace’s brilliance as a rock composer and instrumentalist as well as his gift for writing and delivering obscure but intriguing lyrics. 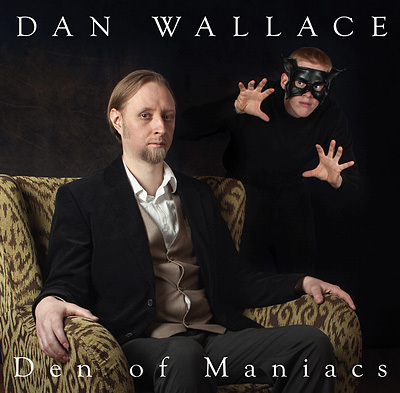 As has been his pattern, Dan Wallace has once again produced an original album not designed for the mainstream or the musically squeamish. The opening track, “Reattachment,” is a moody, moderate-tempo track that begins with an exquisite burst of guitar work over a bed of bass, acoustic guitar and drums, followed shortly by the introduction of Wallace’s vocals. The over-all effect is like Jack Bruce channeling David Bowie’s Commander Tom as Wallace sings harmony parts separated by at least an octave, the near-falsetto lead part dominating and lending an air of ‘lost-ness’ to the lyric. 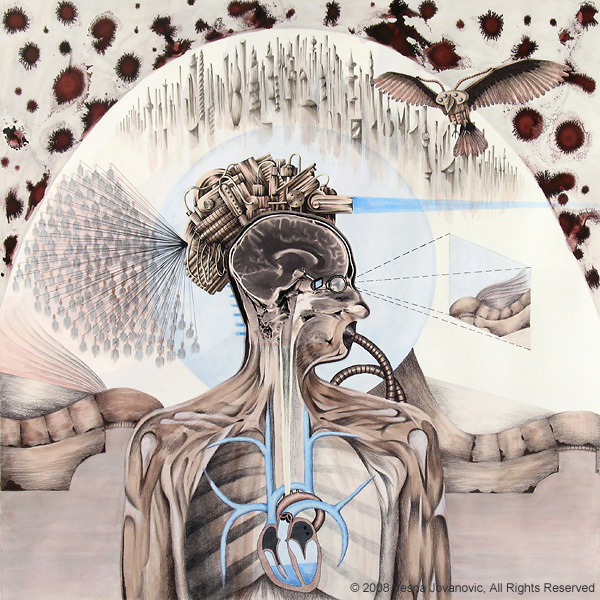 An MRI scan of Wallace’s brain is used in the CD cover art (by Vesna Jovanovic), and emphasizes the fact that Wallace is inviting us into his deepest observances, disappointments, confusions and conclusions about life up to this point. Like on "Culture of Self", Wallace treats us to some instrumental pieces on "Reattachment". “South of Heaven” is a delightful waltz featuring Dan on acoustic guitars and multi-tracked vocals, “Brittle Tongues” is a short guitar piece with a slightly oriental flavor, and “Elegy” is an elegant acoustic guitar composition featuring dazzling finger work and a classical/jazz/flamenco approach that results in slightly more than four minutes of guitar-lovers’ heaven. 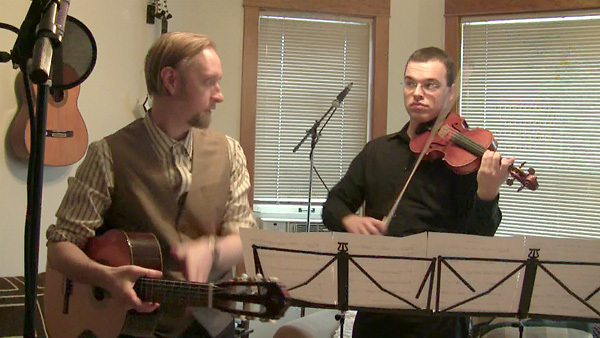 Although Wallace’s background in chamber music is evident even in the rock compositions, it becomes even more noticeable in his solo guitar moments like this one. Introduced by a barrage of drums, “Invisible Lines” displays Wallace’s amazing use of melody, time changes and interesting chord progressions, as he effortlessly creates perfect musical sense out of dissonance, melodic leaps and carnival-like tempo changes. Behind all of this is Wallace’s amazing guitar, bass, synth, hand drum and vocal skill. As a singer, Wallace has great range and a vulnerable, unaffected style: able to slip in and out of falsetto parts, and possessing a natural vibrato at the end of a phrase, Wallace’s voice falls somewhere between Brian Wilson and Dan Hicks (speaking of Dan Hicks – “Odd Man Out,” with its Django-esqe guitar licks and frantic pace, sounds tailor-made for Hicks and his Hot Licks!). “Spellbound,” for its surreal and disturbing lyrics (“…razor in the right hand / drugs in the milk / these surreal amnesia dreams / slinking through guilt labyrinthine …”) is a progressive art-pop tour-de-force, with Wallace at his most appealingly off-beat Beach Boys-meet-Todd Rundgren mode, throwing in a stunning jazz-pop section near the end. It’s ‘out there’ enough to make it a challenging listen, and engaging enough to capture all but the dullest of ears. Thanks, Dan Wallace, for giving us so much to hear. I've been impressed by Wallace's work for years. One of my favorite things about him is that he doesn't stand still. He's equally adept in the worlds of pop, rock, blues and country, and he often melds them in interesting ways. The title track (and first song) is a great spacey piece. The second song takes a great blues lick and turns it into an intricate rocker. And so it goes. I do believe that Wallace has gained confidence over the years. His early stuff was simpler, or at least, he didn't try to incorporate as many different ideas in a single song. He not only blenderizes just about every song on this album, he does so with a style and grace that is almost unthinkable. One of the more interesting things I noticed on a couple tracks here was a definite Steve Miller influence. The good Steve Miller, the bluesman who threw some stellar guitar work into 70s rock and created a handful of the greatest rock and roll songs of all time. Wallace refuses to dumb down his ideas, which means that his songs never quite reach Miller's epochal middle-of-the-road sound, but there are hints of what might be. Plenty of other hints as well, such as the occasional Reinhardtian guitar run and such. Indeed, the most impressive thing about Wallace's music is his guitar work. But his increasingly complex and stirring songwriting is catching up. This is his strongest work to date. And I don't hear any reason why he'd be falling off any time in the near future. This restless composer-turned-songwriter (formerly co-Director of the Chicago Chamber Music Collective) seems eager to make up for lost time since his band The Pindrops broke up in 2004. This is now his third solo album in three years, following Neon and Gold and Culture of Self. As before, he employs traditional rock instruments, playing most of them himself, while subtly infusing more wide-ranging, eclectic styles, like classical waltzes, jazz-tinged flamenco, and Zappa-inspired blues folk – you can even detect an underlying Radiohead influence, as on “27”. Meanwhile, Wallace gracefully croons his introspective, esoteric lyrics in an almost stream-of-consciousness manner, in a voice that hints of Jeff Buckley, Rufus Wainwright, and on the contemplative “Spellbound,” Brian Wilson. Once again, he’s managed to turn out another intriguing, idiosyncratic, and involving work. Von dem amerikanischen Songwriter Dan Wallace habe ich letztes Jahr schon das Vorgänger-Album 'Culture Of Self' besprochen. Ein hochinteressantes Album am Rande des Rock, das vor allem ein bißchen an Frank Zappa erinnerte. Jetzt gibt es mit 'Reattachment' einen neuen Output. Und ich muss sagen, dass diese CD eindeutig leichter zu verdauen ist. Teilweise richtig schöne Melodien (z.B. der Song 'South Of Heaven'), die so richtig flockig und fröhlich runtergehen wie Öl. Solche Seiten waren auf dem Vorgänger-Album noch nicht zu hören. Aber auch das zappaeske kommt nicht zu kurz ('Invisible Lines', um nur mal einen Song zu nennen). Insgesamt ist Dan Wallace aber melodischer geworden, ohne auch nur eine Sekunde langweilig zu klingen. Dan Wallace spielt ja alle Instrumente selbst (nur auf ein paar Stücken wird er von Schlagzeuger George Lawler unterstützt) und ich möchte vor allem sein Gitarrenspiel hervorheben, das sich vor Szene-Größen nicht verstecken braucht. Klar ist auch 'Reattachment' nicht wirklich leichte Kost und es braucht schon ein paar Hördurchgänge, bis sich die einzelnen Songs erschließen (auch wenn sie mit so zwischen 3 und 6 Minuten nicht wirklich lang und kompliziert sind). Doch lohnt sich wirklich der Zeitaufwand, um in die Musik richtig einzutauchen. Musikliebhaber die auch abseits des Prog ein Ohr riskieren, sollten Dan Wallace auf jeden Fall mal antesten. 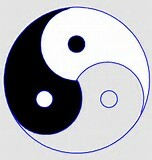 "Culture Of Self is about daring to be different, and the magic that comes when you do. Even if it were only half as good as it is, it should be treasured for its originality alone." 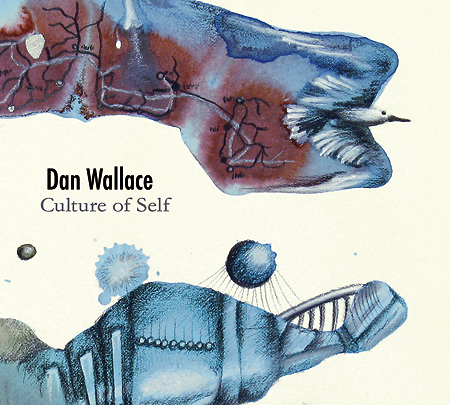 "Lucky for us, on Culture of Self, Dan Wallace has gone where most artists haven’t been." "It's hard not to fall for this intoxicating and expertly-crafted LP." "There’s definitely something innovative about Neon and Gold. Maybe it’s the neo-psychedelic arrangements, the Alice-in-Wonderland lyrics or the smooth-as-silk delivery. Maybe we should listen again." "Wallace will always take the road less taken, though he's careful to line it with rose petals. That consideration for the listener is what makes this album such a simple pleasure to hear." Dan Wallace is a composer based in Chicago, IL. Since the release of his 2006 album Neon and Gold, of which Mark Suppanz of The Big Takeover said: "It's hard not to fall for this intoxicating and expertly-crafted LP", Wallace has been steadily establishing himself as one of the more adventurous voices in indie rock. 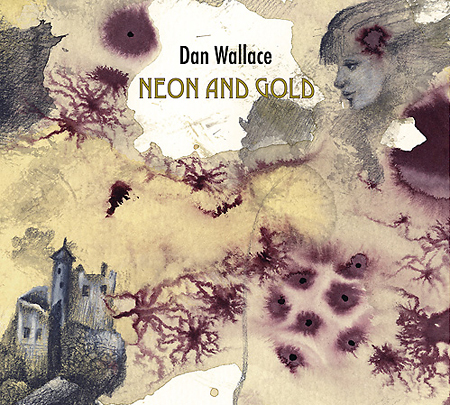 Music reviewer Michael Mee of Americana UK had this to say about Wallace's 2007 follow-up to Neon and Gold : "Put simply, Culture Of Self is about daring to be different, and the magic that comes when you do." His newest release is Reattachment. He is joined by George Lawler on drums, and the album art is by Vesna Jovanovic. Reattachment is a Torito Bravo Records release. A sampling of Wallace's past projects include fronting the indie rock band The Pindrops, scoring music for theatre and film, serving as co-Director of the Chicago Chamber Music Collective (who also premiered his first chamber works in Chicago), and organizing critically acclaimed concert series of contemporary classical music. He is also a CAAP Grant recipient. * Congratulations! Your song 'Go Ahead' is now #32 on the KIAC Big 50! * Your song 'The Heap' has just been added to eclectica station! * Your song 'Odd Man Out' has just been added to St. Alphonso's Pancake Breakfast station! * Your song 'Vante Left Them Human' has just been added to Outside the Window station! * Your song 'The Heap' has just been added to Forest of Azure station! * Your song 'The Heap' has just been added to Indie sound of America and beyond station! * Your song 'The Heap' has just been added to Indigo Station station! * Your song 'Vante Left Them Human' has just been added to Minstrels station! * Your song 'Reattachment' has just been added to KIAC Hitline station! * Your song 'Go Ahead' has just been added to morceaux !maya! station! * Your song 'Vante Left Them Human' has just been added to morceaux !maya! station! * Your song 'Razorblade Twin' has just been added to morceaux !maya! station! * Your song 'Odd Man Out' has just been added to eclectica station! * Congratulations! Your song 'Odd Man Out' is now #12 on the KIAC Underground 40! * Congratulations! Your song 'Go Ahead' is now #21 on the KIAC Big 50! * Congratulations! Your song 'Go Ahead' is now #17 on the KIAC Big 50! * Your song 'Spellbound' has just been added to pro-racing cap station station! * Your song 'Go Ahead' has just been added to BTCR station! * Your song 'Go Ahead' has just been added to Larree Ringtones station! * Congratulations! Your song 'Odd Man Out' is now #5 on the KIAC Underground 40! * Congratulations! Your song 'Go Ahead' is now #9 on the KIAC Big 50! * Your song 'Odd Man Out' has just been added to Totally Amazing Songs station! * Your song 'Perfect Weather for a Superhero' has just been added to KIAC Hitline station! * Your song 'South of Heaven' has just been added to SPARKLERS station! * Your song 'Perfect Weather for a Superhero' has just been added to St. Alphonso's Pancake Breakfast station! * Congratulations! Your song 'Odd Man Out' is now #1 on the KIAC Underground 40! * Your song 'Odd Man Out' has just been added to Tax & Regulate Cannabis 2010 station! * Your song 'Go Away' has just been added to RADIO RADIO station! * Your song 'Look at Me' has just been added to Sonic Alchemy station! * Your song 'Look at Me' has just been added to Adventurers, Jugglers, Minstrels 3 station! * Your song 'Take it Back' has just been added to I'm All Ears station! * Your song 'Take it Back' has just been added to Awesome Audio station! * Your song 'Fever' has just been added to Awesome Audio station! IMP Your song 'Le Néant' has just been added to Moody, Cool, Psychotic, and Mesmerizing station! IMP Your song 'Le Néant' has just been added to CHAOS! CURBS! CURSES! ... ... ... station! IMP Your song 'Maybe' has just been added to JUST LISTEN! station! IMP Your song 'Vante Left Them Human' has just been added to Musings station! IMP Your song 'Jacques' has just been added to JUST LISTEN! station! IMP Your song 'Odd Man Out' has just been added to I Like Strange. ~M~ station! IMP Your song 'Odd Man Out' has just been added to Barefoot on a Dirt-Floor station! IMP Your song 'Look at Me' has just been added to Moody, Cool, Psychotic, and Mesmerizing station! IMP Your song 'Look at Me' has just been added to Musings station! IMP Your song 'Look at Me' has just been added to Apocalypse Radio station! IMP Your song 'Look at Me' has just been added to Church of the Red Room station! IMP Your song 'Look at Me' has just been added to JUST LISTEN! station! IMP Your song 'Look at Me' has just been added to Obama-Nation! station! IMP Your song 'Look at Me' has just been added to CHAOS! CURBS! CURSES! ... ... ... station! IMP Your song 'Look at Me' has just been added to America Destroyed... (an Inside Job) station! Reattachment is out now! Listen to the entire album here, and add the songs to your stations while you're at it. Order the album at CDBaby by clicking the above link. Click here for an extensive list of vendors.